On a race through history with the mysterious Mr. Moundshroud, 8 boys must learn the secrets and origins of Halloween night in order that they might save the life of their friend, Pipkin, who has been stricken ill on Halloween. 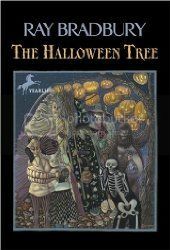 Ray Bradbury weaves an imaginative story that creates a rather simplified but no less interesting history of Halloween night and the customs and cultural significances throughout history that help to create the holiday that we celebrate today. With his usual imagery, Bradbury's story is steeped in the eerie and sometimes scary nature that is Halloween night. One of my favorites to read this time of year.